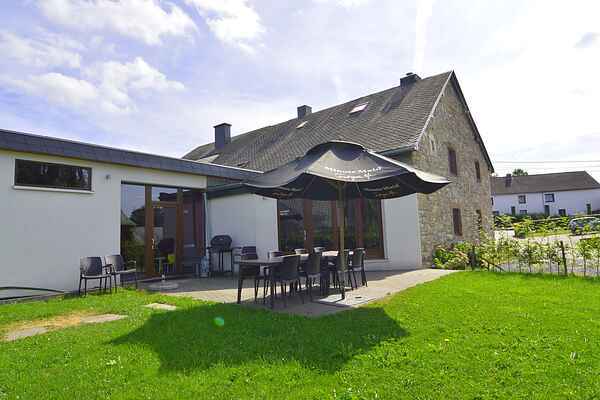 A confortable and spacious house located in the picturesque village Ondenval, near the lakes of Robertville and Butgenbach and the tourist towns of Malmedy and Stavelot. This village house, which formerly served as the village pub, has been renovated with great attention to detail: lots of colours and modern comfort. In the large relaxation area you can enjoy billiard or enjoy the sauna and solarium. This is the ideal house for families in search of a spacious yet cosy holiday home. The homeowners live in the farm next door (no nuisance due to the farm for you though) and can give you many advices about the activities to do in the surroundings. The farm makes no nuisance, quite the contrary, some of you will probably even appreciate the fact that you can buy there some fresh dairy products such as milk or eggs and meat.